From Fumihiko Sori, director of the groundbreaking CG animated feature Vexille, comes another breathtaking sci-fi spectacle, this time in the form of a two-episode OVA. Adapted from two unrelated stories from the 19 stories that make up the 2001 Nights manga written and illustrated by Yukinobu Hoshino, TO – 2001 Nights is a beautifully envisioned homage to the golden age of literary and cinematic science fiction. In the first of the two stories, Elliptical Orbit, the crew aboard the earth-orbiting space station Midnight Bazooka are busy propelling containers of essential supplies toward a moon-base when they are visited by the starship, the Flying Dutchman. Returning from a 15-year mission in deep space, the Dutchman is carrying a cargo of liquid protons bound for earth. Thanks to extended periods of hyper-sleep, the ship's captain, Maria, has remained her young, beautiful self while her former lover and captain of the Bazooka, Dan, has aged as normal, but still their emotional bonds remain as strong as ever. As Dan and Maria catch up on old times, the space station is invaded by an army of terrorists intent on destroying the moon-base by firing the Dutchman's cargo into it. Heavily outgunned and outnumbered, Dan and Maria's respective crew members are forced to join together in a deadly face-off to save their own lives and those of their colleagues on the moon. An interstellar Romeo and Juliet romance forms the heart of Symbiotic Planet as two young lovers from different human outposts on the same alien planet conduct their relationship in secret against the wishes of their superiors. Ion is a member of the American-European outpost, while his sweetheart Alena hails from the Eurasian contingent. Despite UN intervention, a dispute over territorial rights between the two contingents threatens to degenerate into a military conflict. As hostilities begin to escalate, Ion is accidentally exposed to an unknown variety of alien spores in his outpost's research lab and is forced to quarantine himself as his body begins to mutate. But, with the two factions now on the brink of war, it is up to the strangely transformed Ion to convince the antagonists that there is another, albeit non-human, option. TO – 2001 Nights (cert. 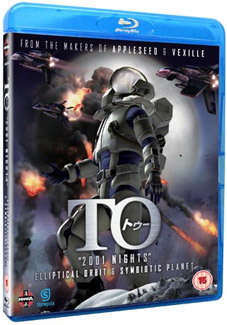 15) will be released on UK DVD (£19.99) and Blu-ray (£24.99) by Manga Entertainment on 26th September 2011.